Where energy policy is concerned, transportation is a tough nut to crack. Energy end use falls into three broad categories: Industry, buildings, and transportation. Ontario consumption is roughly equal in each. So far, Guelph’s Community Energy Initiative (CEI) has focused on buildings. Industry already gets a lot of love from Conservation and Demand Management (or Demand-Side Management, if you’re talking about natural gas rather than electricity). Plenty of CDM/DSM incentive dollars are available to industrial enterprises, since energy consumption is concentrated and a single efficiency project can go a long way. Industry has gotten some CEI attention as it can be both a supplier and customer of a thermal energy utility, and again big demand is concentrated in a relatively small space. Transportation has been largely left out in the cold. This is because any incentive program will be difficult to formulate for a specific target population, and will struggle to produce a fast payback. Transportation is, by definition, mobile. Vehicles plying the streets of Guelph are either based here, or they come here from somewhere else. A program aimed at reducing transportation energy use may be aimed at the home base for a vehicle, or alternatively at the destination. It’s difficult for a municipality to justify a program that will primarily affect vehicles that drive here from elsewhere (fuel trucks, say), nor does it make sense to target vehicles that are based here but spend a good chunk of their life outside of the City limits (because they commute to Kitchener-Waterloo or the GTA, for example). Ideally a program would pick out the vehicles that are based in Guelph and rarely leave Guelph, but that’s a tall order. Another challenge is how to devise a program to reduce energy use for transportation with reasonably quick results. You can stimulate active transportation by providing bike lanes, and Guelph is doing this (recently winning a silver award for being one of Ontario’s most bike-friendly cities). You can also plan urban development so that people don’t need to drive so much to clear their to-do lists, and Guelph is doing this as well. However, these are programs that pay off only in the medium to long term. Transportation energy usage stubbornly resists the quick-win improvement. It is tempting to score a short-term victory by stimulating uptake of a particular energy-efficient technology. However, picking technology winners is something that governments have rarely done well, whether this is for a particular player in a given industry, or for an entire sector. As an example of the former, the Obama administration got burned by a US$536 million loan guarantee to the solar company Solyndra, which went bankrupt in 2011. As for the latter, if you’d surveyed the market for alternative vehicle drive systems fifteen years ago, you might well have bet on fuel cells. A survey of today’s urban streets would yield exactly zero examples of such vehicles. If you get into the game before the market has pronounced judgement, it’s a great way to lose your shirt. If you wait too long, the incentive will not change the outcome from what would have happened anyway. Timing is key. These days, a number of alternative fuel technologies are showing broad market acceptance. For small vehicles, electric drive systems are becoming ever more prevalent, starting with hybrid electric vehicles (HEVs) like the Toyota Prius, then moving on to plug-in hybrid electric vehicles (PHEVs) like the Chevy Volt, and then true electric vehicles (EVs) like the Nissan Leaf and my own personal dream car, the now-out-of-production Tesla Roadster (I know, I’m dreaming in technicolour if I think I’ll ever afford such a ride on a municipal employee’s salary). For larger vehicles, Compressed Natural Gas (CNG) shows a lot of promise. HEVs and PHEVs offer energy efficiency improvements over traditional internal combustion vehicles, but they both still have gasoline engines. Money spent on gasoline fuel leaves the community, never to return. EVs, however, run exclusively on electricity, which can be generated locally, injecting cash back into the community rather than bleeding it away to faraway refiners and producers. This makes EVs the most attractive target out of the three for an incentive program. Two key barriers to EV adoption are range anxiety and cost literacy. Although the “fuel” for EVs is everywhere that society is found, the chargers – Electric Vehicle Supply Equipment (EVSE), to use the industry jargon – are far from ubiquitous. Prospective owners worry that they might get stuck somewhere en route with a dead battery. A program to provide more EVSEs, either at home base or typical destinations (malls, say, or employee parking), can alleviate this so-called range anxiety. Cost literacy is another barrier. Car shoppers look at sticker price, but that has nothing to do with their ability to pay. When costs are expressed as a monthly payment, they can actually be compared to a household budget. However, with EVs, this cost is only part of the story. The base cost is higher, but the operating cost is peanuts. I attended a seminar at the Waterloo Institute for Sustainable Energy, where I learned that when cost is expressed as total monthly figure – fuel included – EVs win hands down against comparable internal combustion vehicles. An incentive program could be geared at simply clarifying this fact for car purchasers. For larger vehicles, electric drive is still seems iffy, Edmonton’s choice to test electric buses notwithstanding. For this category, Compressed Natural Gas (CNG) is attractive. After a false start in the 1990s, this technology appears ready for prime time. It’s still a fossil fuel, true. However, a CNG vehicle produces 20% less greenhouse gases than a comparable diesel or normal gasoline vehicle, and virtually zero NOx, SOx, and particulates. It also has a significant cost advantage – CNG would be the equivalent of $0.45/L gasoline. Even with gas prices as low as they currently are (by recent, not historical standards), that offers a competitive return on the cost to convert existing vehicles, or the incremental cost to choose a new CNG vehicle over the gas/diesel model. With all that said, HEVs, PHEVs, EVs, and CNG vehicles don’t hold a candle to the revolutionary possibilities of another emerging transportation technology. More on that in my next post. The bears have it figured out. Their diet consists of berries, shoots, grasses, honey, squirrels, salmon, and the odd unfortunate hiker. Though these foods are plentiful in the warmer months, they become scarce to non-existent in winter. But bears don’t starve when the snow falls. In late summer and fall they gorge themselves, storing up reserves of fat, and then settle down in a convenient den to sleep away the lean wintertime. 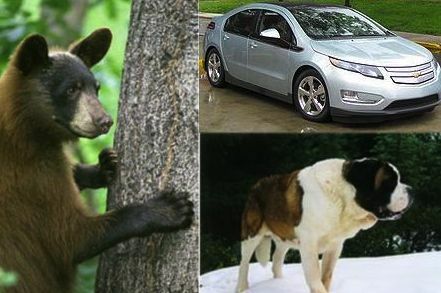 Like bear food, renewable energy sources such as wind and solar are not available all the time. Sometimes the wind does not blow. Sometimes the sun does not shine. Like bears, we can adjust our electricity consumption to match when it is available, but only up to a point. We need to power our hospitals, public transit, roadway lighting, and innumerable other non-negotiables. For now, this isn’t a problem. Wind and solar are merely the garnish on the edge of our collective energy plate. The mainstays of our energy diet are hydroelectric dams, nuclear reactors, and thermal plants which produce electricity by burning fossil fuels. However, this is a passing state of affairs. Most significant sources of hydropower have already been tapped. Nuclear is prone to massive construction cost overruns and rare but catastrophic accidents, and carries a near-perpetual liability of radioactive waste storage. Fossil fuels – coal, oil and natural gas – grow more expensive and scarce, and will inevitably price themselves out of the market. More troubling is the local acid rain and global climate change that they cause. Sooner or later, all of our energy will have to be renewable. If we are to avoid massive collapse of world ecosystems under the weight of runaway global warming, it had best be sooner rather than later. But before that can happen, we will have to smooth over the difference between the pattern of generation and the pattern of consumption. That means finding methods to store energy on a huge scale. What are we going to do, build a massive rechargeable battery? No. But we are going to build a whole bunch of little ones. Some of these rechargeable batteries won’t be so little. Pumped storage, like the 400MW facility proposed in Marmora, Ontario, uses cheap off-peak electricity (picture wind turbines spinning madly on blustery nights) to pump water into an elevated reservoir. Then, when rates are high, the water is allowed to flow back down into a lower reservoir, turning turbines and generating – well, re-generating – electricity. The other rechargeable batteries are actually the solution to two problems. Nearly every mode of transportation – be it the plane, the train, or the automobile – relies on combustion of fossil fuels. But like fossil fuels, the internal combustion engine’s days are numbered. The transition to post-gasoline transportation began in 1997, with the advent of Toyota’s hybrid gas-electric Prius, and continues today with the plug-in hybrid Chevy Volt and its brethren. Eventually internal combustion engines will go the way of the electric typewriter, electric cars will reign supreme, and a sizeable rechargeable battery will be parked in every driveway. These will charge up at night, when both electricity demand and electricity rates are low. When the sun rides high, and electricity rates do likewise, and the car is just sitting in a parking lot anyway, some of that stored energy will be fed back into the grid. And the owner will get credit for it. That brings us to the third column holding up the temple of the new energy economy. The price we pay for electricity is like a fixed-rate mortgage. We know exactly how much our payment will be each month. It’s predictable. It’s easy to understand. And, in the long run, it’s also a lot more costly than a variable-rate mortgage. Our electricity prices are fixed through government regulation. The electricity utility has to deal with a spot price that moves all over the place in response to the laws of supply and demand. However, we as consumers never see that. We are insulated from the harsh reality of fluctuating electricity costs. We are protected. And, just like with a fixed-rate mortgage, that protection comes at a cost. Early in the previous decade, various jurisdictions flirted with the idea of removing this protection. Let the price that consumers pay reflect the cost to the utility, and people will make sensible economic decisions about such things as when to run their air conditioner, dishwasher, and clothes dryer. Ultimately that should drive costs down, right? The problem was that it was a case of too much, too soon. Consumers were not used to adjusting their electricity usage to reflect the spot price, and they were not given time to adapt. Their appliances did not offer automation to make this adaptation any easier. And the mechanism to supply price information to customers was also flawed. Our electricity grid is like a Saint Bernard – big, dumb, and not agile in the slightest. It can cope with a small number of high-output generating stations, but not with a huge number of tiny ones. It is ill-equipped to power a panoply of high-tech devices that react badly to random voltage fluctuations – fluctuations that were inconsequential at the time that the grid was designed and built, when people were only plugging in such comparatively insensitive devices as electric lights and toasters. It can figure out how much electricity each customer uses, but not – at least until recently – when that electricity was consumed. And it cannot cope with the meter running backwards, which is what will happen when rooftop solar panels and electric car batteries are feeding power back into a needy grid. The technology now exists to match up supply and demand in real-time. It allows for appliances to become smarter about when they start up and shut down, avoiding peak usage periods. It allows for electricity to be generated everywhere, instead of solely in massive centralized plants. It allows metering of electricity being fed in as well as being drawn out. And it allows one part of the grid to isolate itself from another during a fault, preventing massive cascading system failures like the Northeast blackout of 2003. These technologies are referred to collectively as the smart microgrid. Renewable energy, electric vehicles, and the smart microgrid are the three key technologies that will deliver us from the dead-end energy world of today into the living, breathing, and clean energy world of tomorrow. But technology is only part of the solution. Next week I’ll discuss the people and political side.